On Rememberance Day long weekend we embarked on the long journey from Vancouver to Edmonton to participate in the very first annual Alberta Electronic Music Conference held at various locations around Edmonton. The weekend long conference was a collaborative passion project between Isis Graham (Esette), Andrew Williams (NVS/Dunmore Park) and Matt Carter (KillMidi), all of whom contribute to and foster community within each of their own cities in Alberta. Isis runs Calgary based record label Substation Recordings and previously was involved with producer's meetup Habitat Studio Social, a name you may recognize as the inspiration behind Groundwerk. Andrew, along with his Night Vision collective, have a music school in Edmonton called Night Vision Music Academy, where they offer workshops and classes on electronic music production and DJing as well as photoshop, projection mapping and more. 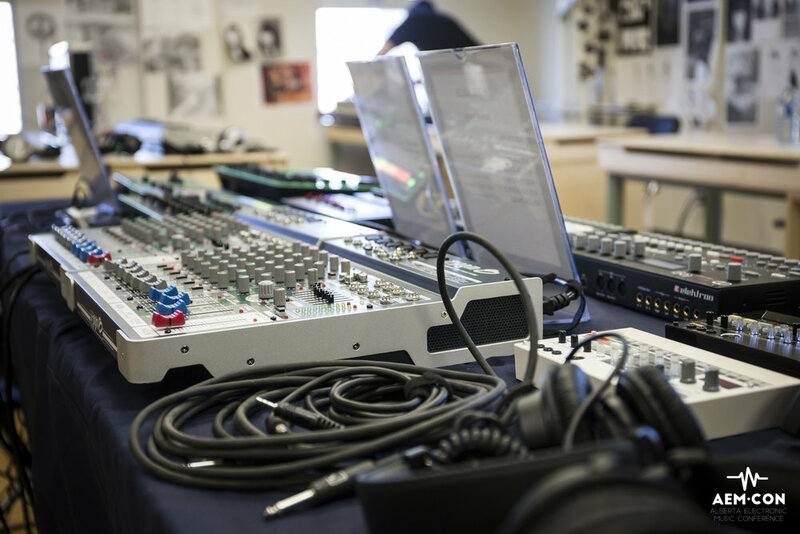 The space also boasts a fully loaded recording studio for students to utilize at their leisure. Matt is the founder of Lethbridge Electronic Music Producers Forum, they meet on a weekly basis at Inferno Nightclub. 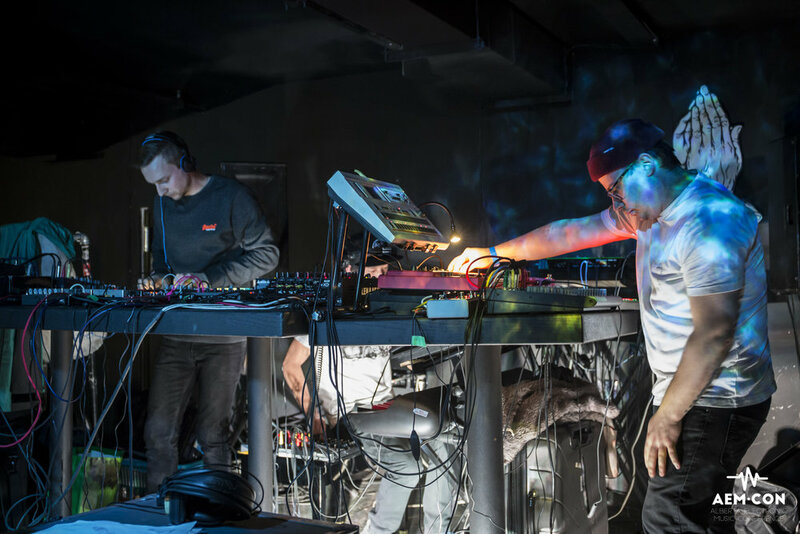 All weekend, The Alberta Electronic Music Conference was buzzing with excitement. From the moment we got into Edmonton until the minute we left, we were constantly on the go, jumping around to different venues trying to catch as much as we possibly could. Though we live for dancing all night in dimly lit rooms, our main focus on this trip was to take in as much of the daytime programming held at the Edmonton Digital Arts College as possible. We came to learn, connect with likeminded individuals and to build relationships with our regional network. The daytime programming was impressive and overwhelming in the best way. There were three rooms filled with programming going on all day, hosting workshops, panel discussions and keynote presentations on a variety of topics all within the world of electronic music. A few of our favourite ones were Getting the Word Out (reaching fans using traditional and new media) taught by Paul Brooks (Bass Coast/Beatdrop/CJSW), Intro to Mastering taught by Timothy Allen, Digital Label Forum moderated by our own Joel West, The Art of Flow by Night Vision's Adam Johan and Ardalan's Keynote. You can watch the first two at the bottom of this article! My main highlight was on Sunday afternoon during the Gear Swap, because what's more exciting than entering a room full of synthesizers spread out across multiple tables? Being able to roam around, ask questions and get my hands on the different synthesizers was so inspiring, and ingnited a creative spark in me, I needed to learn how to play them! As a music enthusiast, commuinty builder and event coordinator, I hadn't had much of an interest in producing my own music until I found myself toying around on Roland's Bass Line Synth. I spent the rest of the afternoon experimenting with each of the instruments, keen on learning more. To say that conferences like AEMCON are needed in Western Canada is an understatement. Contrary to popular belief, the Electronic Music world is not just about raving and staying up all night. Each of our cities have a vibrant scene full of artists and music enthusiasts that need spaces and events where they can express themselves and network in a non-party setting. Conferences provide a place for artists and music enthusiasts to connect with one another, share ideas and learn about the industry. It's where collaborations and beautiful creative, relatioships are born. AEMCON 2016 was a wonderful experience for the Groundwerk Team. We came, we learned, we connected, we danced and drove all the way home, reflecting and brainstorming the whole way back. The weekend left us feeling incredibly inspired and filled with so much love and excitement for what is to come. We hope to see you in Calgary for AEMCON 2017.